- Diogenes Laertius, Lives of Eminent Philosophers. Solons 10 Commandments are not relevant only to the U.S.A. They are relevant to all people and countries on our beloved planet! 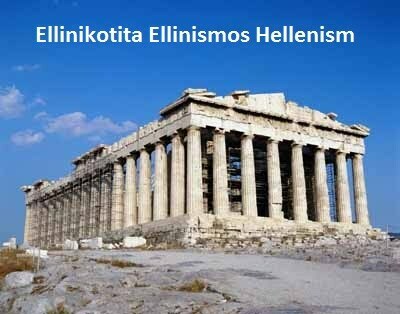 They are indeed relevant to Hellenes all around the world! I keep hearing this chant, variously phrased: "The Ten Commandments are the foundation of Western morality and the American Constitution and government." In saying this, people are essentially crediting Moses with the invention of ethics, democracy and civil rights, a claim that is of course absurd. But its absurdity is eclipsed by its injustice, for there is another lawmaker who is far more important to us, whose ideas and actions lie far more at the foundation of American government, and whose own Ten Commandments were distributed at large and influencing the greatest civilizations of the West--Greece and Rome--for well over half a millennia before the laws of Moses were anything near a universal social influence. In fact, by the time the Ten Commandments of Moses had any real chance of being the foundation of anything in Western society, democracy and civil rights had all but died out, never to rise again until the ideals of our true hero, the real man to whom we owe all reverence, were rediscovered and implemented in what we now call "modern democratic principles." The man I am talking about is Solon the Athenian. Solon was born, we believe, around 638 B.C.E., and lived until approximately 558, but the date in his life of greatest importance to us is the year he was elected to create a constitution for Athens, 594 B.C.E. How important is this man? Let's examine what we owe to him, in comparison with the legendary author (or at last, in legend, the transmitter) of the Judeo-Christian Ten Commandments. Solon is the founder of Western democracy and the first man in history to articulate ideas of equal rights for all citizens, and though he did not go nearly as far in the latter as we have come today, Moses can claim no connection to either. Solon was the first man in Western history to publicly record a civil constitution in writing. No one in Hebrew history did anything of the kind, least of all Moses. Solon advocated not only the right but even the duty of every citizen to bear arms in the defense of the state--to him we owe the 2nd Amendment. Nothing about that is to be found in the Ten Commandments of Moses. Solon set up laws defending the principles and importance of private property, state encouragement of economic trades and crafts, and a strong middle class--the ideals which lie at the heart of American prosperity, yet which cannot be credited at all to Moses. Solon is the first man in history to eliminate birth as a basis for government office, and to create democratic assemblies open to all male citizens, such that no law could be passed without the majority vote of all. The notion of letting women into full political rights would not arise in any culture until that of modern Europe, but democracy never gets a single word in the Bible. Solon invented the right of appeal and trial by jury, whereby an assembly of citizens chosen at random, without regard for office or wealth or birth, gave all legal verdicts. Moses can claim nothing as fundamental as these developments, which are absolutely essential to modern society. The concept of taking a government official to court for malfeasance we owe to Solon. We read nothing of the kind about Moses. The idea of allowing foreigners who have mastered a useful trade to immigrate and become citizens is also an original invention of Solon--indeed, the modern concept of citizenship itself is largely indebted to him. There is nothing like this in the Bible. And like our own George Washington, Solon declined the offer to become ruler in his country, giving it a Constitution instead--unlike Moses who gave laws yet continued to reign. And Solon's selfless creation of the Athenian constitution set the course which led to the rise of the first universal democracy in the United States, and it was to Solon's Athens, not the Bible, that our Founding Fathers looked for guidance in constructing a new State. Moses can claim no responsibility for this. If we had Solon and no Moses, we would very likely still be where we are today. But if we had Moses and no Solon, democracy might never have existed at all. So much for being the impetus behind our Constitution. The Ten Commandments of Moses have no connection with that, while the Constitution of Solon has everything to do with it. But what about ethics? Let us examine the Ten Commandments offered by each of these men and compare their worth and significance to Western society. Of course, neither man's list was unique to him--Moses was merely borrowing ideas that had already been chiseled in stone centuries before by Hammurabi, King of Babylon (and unlike the supposed tablets of Moses, the Stone of Hammurabi still exists and is on display in the Louvre). Likewise, Solon's Ten Ethical Dicta were a reflection and refinement of wisdom that was already ancient in his day. And in both cases the association of these men with their moral precepts is as likely legend as fact, but the existence and reverence for their sayings in their respective cultures was still real--and we can ask three questions: Which list of Ten Commandments lies more at the heart of modern Western moral ideals? Which contains concepts that are more responsible for our current social success and humanity? And which is more profound and more fitting for a free society? The Ten Commandments of Moses (Deuteronomy 5:6-21, Exodus 20:3-16) run as follows--and I am even going out of my way to leave out the bounteous and blatantly-religious language that actually surrounds them in the original text, as well as the tacit approval of slavery present in the fourth commandment, none of which is even remotely suitable for political endorsement by a free republic: 1. Have no other gods before me [the God of the Hebrews]. 2. Make no images of anything in heaven, earth or the sea, and do not worship or labor for them. 3. Do not vainly use the name of your God [the God of the Hebrews]. 4. Do no work on the seventh day of the week. 5. Honor your parents. 6. Do not kill. 7. Do not commit adultery. 8. Do not steal. 9. Do not give false testimony against another. 10. Do not desire another's wife or anything that belongs to another. Now, we can see at once that our society is entirely opposed to the first four, and indeed the last of these ten. As a capitalist society, we scoff at the idea of closing our shops on a choice market day. And our very goal in life is to desire--desiring is what drives us toward success and prosperity. The phrase "seeking the American Dream," which lies at the heart of our social world, has at its heart the very idea of coveting the success of our peers, goading us to match it with our own industry, and we owe all our monumental national success to this. Finally, our ideals of religious liberty and free speech, essential to any truly civil society, compel us to abhor the first three commandments. Thus, already half of Moses' doctrines cannot be the foundation of our modern society--to the contrary, they are anathema to modern ideals. Of the rest, it can be assured that shunning adultery has never contributed to the rise of civil rights and democratic principles (despite much trying, there is no Adultery Amendment). It is naturally regarded as immoral--but then it always has been, by all societies, before and since the time of Moses, for the simple reason that it, like lying, theft, and murder, does harm to others, and thus these commandments are as redundant as they are unprofound. They can be more usefully summed up with just three words: do no harm. These words comprise the first commandment of another Greek moralist whose contribution to society lies at the very heart of modern reality: the founder of scientific medicine, Hippocrates. Finally, we are left with only one commandment, to honor our parents. This of course has been a foundational principle of every society ever since such things as "societies" existed. Yet the greatest advances in civil rights and civic moral consciousness in human history occurred precisely as the result not of obeying, but of disobeying this very commandment: the social revolutions of the sixties, naturally abhorred by conservatives and yet spearheaded by rebellious teenagers and young adults, nevertheless secured the moral rights of women and minorities--something unprecedented in human history--and by opposing the Vietnam war, our children displayed for the first time a massive popular movement in defense of the very pacifism which Christians boast of having introduced into the world, yet are usually the last to actually stand up for. It can even be said that our entire moral ethos is one of thinking for ourselves, of rebellion and moral autonomy, of daring to stand up against even our elders when our conscience compels it. Thus, it would seem that even this commandment does not lie at the heart of our modern society--it is largely an anachronism, lacking the essential nuances that a more profound ethic promotes. Let us now turn to the Ten Commandments of Solon (Diogenes Laertius, Lives of Eminent Philosophers, 1.60), which run as follows: 1. Trust good character more than promises. 2. Do not speak falsely. 3. Do good things. 4. Do not be hasty in making friends, but do not abandon them once made. 5. Learn to obey before you command. 6. When giving advice, do not recommend what is most pleasing, but what is most useful. 7. Make reason your supreme commander. 8. Do not associate with people who do bad things. 9. Honor the gods. 10. Have regard for your parents. Unlike the Commandments of Moses, none of these is outdated or antithetical to modern moral or political thought. Every one could be taken up by anyone today, of any creed--except perhaps only one. And indeed, there is something much more profound in these commandments. They are far more useful as precepts for living one's life. Can society, can government, prevail and prosper if we fail to uphold the First Commandment of Moses? By our own written declaration of religious liberty for all, we have staked our entire national destiny on the belief that we not only can get by without it, but we ought to abolish it entirely. Yet what if we were to fail to uphold Solon's first commandment? The danger to society would be clear--indeed, doesn't this commandment speak to the heart of what makes or breaks a democratic society? Isn't it absolutely fundamental that we not trust the promises of politicians and flatterers, but elect our leaders and choose our friends instead by taking the trouble to evaluate the goodness of their character? This, then, can truly be said to be an ideal that is fundamental to modern moral and political thought. Now, two of the commandments of Solon are almost identical to those advocated by Moses: do not speak falsely, and have regard for your parents. Of course, Solon does not restrict his first injunction to false accusations or testimony against others, as Moses does. Solon's commandment is more profound and thus more fundamental, and is properly qualified by the other commandments in just the way we believe is appropriate--for Solon's rules allow one to lie if doing so is a good deed (no such prescription to do good appears in the Ten Commandments of Moses). And whereas Moses calls us to honor our parents (in the Hebrew, from kabed, "to honor, to glorify"), Solon's choice of words is more appropriate--he only asks us to treat our parents in a respectful way (in the Greek, from aideomai, "to show a sense of regard for, to have compassion upon"), which we can do even if we disobey or oppose them, and even if we disapprove of their character and thus have no grounds to honor them. In contrast with Moses, Solon wastes no words with legalisms--he sums up everything in three words: do good things. This is an essential moral principle, lacking from the commands of Moses, which allows one to qualify all the others. And instead of simply commanding us to follow rules, Solon's commandments involve significant social and political advice: temper our readiness to rebel and to do our own thing (which Solon does not prohibit) by learning first how to follow others; take care when making friends, and stick by them; always give good advice--don't just say what people want to hear; shun bad people. It can be said without doubt that this advice is exactly what we need in order to be successful and secure--as individuals, as communities, and even as a nation. The ideals represented by these commandments really do rest at the foundation of modern American morality and society, and would be far more useful for school children whose greatest dangers are peer influence, rashness and naivete. There is but one that might give a secularist pause: Solon's commandment to honor the gods (in the Greek, timaô, "to honor, to revere, to pay due regard"). Yet when we compare it to the similar First Three Commandments of Moses, we see how much more Solon's single religious commandment can be made to suit our society and our civic ideals: it does not have to restrict religious freedom, for it does not demand that we believe in anyone's god or follow anyone's religious rules. It remains in the appropriate plural. Solon asks us to give the plethora of gods the regard that they are due, and we can say that some gods are not due much--such as the racist gods and gods of hellfire. In the end, it is good to be respectful of the gods of others, which we can do even if we are criticizing them, even if we disbelieve in them. This would remain true to our most prized American ethic of religious liberty and civility. Though it might better be rendered now, "Respect the religions of others," there is something fitting in admitting that there are many gods, the many that people invent and hope for. It is clear then, that if anyone's commandments ought to be posted on school and courthouse walls, it should be Solon's. He has more right as the founder of our civic ideals, and as a more profound and almost modern moral thinker. His commandments are more befitting our civil society, more representative of what we really believe and what we cherish in our laws and economy. And indeed, in the end, they are essentially secular. Is it an accident that when Solon's ideals reigned, there grew democracies and civil rights, and ideals we now consider fundamental to modern Western society, yet when the ideals of Moses replaced them, we had a thousand years of oppression, darkness, and tyranny? Is it coincidence that when the ideals of Moses were replaced with those of Solon, when men decided to fight and die not for the Ten Commandments but for the resurrection of Athenian civil society, we ended up with the great Democratic Revolutions and the social and legal structures that we now take for granted as the height and glory of human achievement and moral goodness? I think we owe our thanks to Solon. Moses did nothing for us--his laws were neither original nor significant in comparison. When people cry for the hanging of the Ten Commandments of Moses on school and court walls, I am astonished. Solon's Ten Commandments have far more right to hang in those places than those of Moses. The Athenian's Commandments are far more noble and profound, and far more appropriate to a free society. Who would have guessed this of a pagan? Maybe everyone of sense.